When the new year’s bells chimed in 2014, I had just turned 30 and was ready to kick start a new way of eating, a new way of exercising, and a new me! Now, that I am not in my twenties anymore, I need to start thinking more about what I put in my body. I will be the first to admit, I used to eat very unhealthy. My goal to be a better version of myself in 2014, has been a slow start but a good one. If you are a regular reader here, you have witnessed me take up running, my 10K last week, and another 10K I did a few months back. You also know how addicted I am to making spinach & kale smoothies and my new water drinking goal with my CitrusZinger. Anything to help me be more healthy and energetic to take on my 10 month old and my 2 1/2 year old, together. I have recently started night school, I know pile another million things ‘to do’ on my already overflowing ‘to do’ list. That’s me. As a busy mommy, wife, housekeeper, and now, student, I need something that is healthy, convenient and taste good for this Mommy on the go. 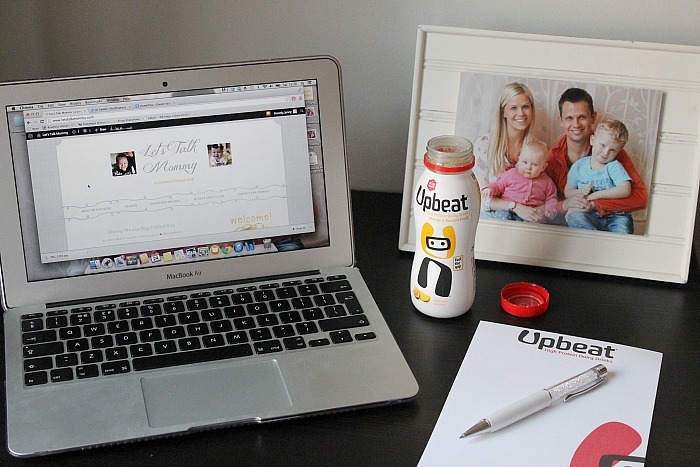 Recently, I was introduced to Upbeat, a high protein fresh dairy drink. With 150 calories, low in fat, and made with real fruit, I couldn’t pass up the opportunity to try some out. I think the Upbeat protein calculator is great too! It helps me know just how much protein I actually should be consuming on a daily basis. Something I have never pay attention to nor knew about until now. You turn the wheel to state your weight and how active you are and your magical protein number will appear in the top box. Easy peasy! These protein drinks are great for a midmorning snack while I do my homework and the kids nap. Or pop in my school bag and drink in class as I don’t always have time to eat my dinner before I go. They keep my energy levels up and my tummy from embarrassingly growling in class as it has done in the past. I was really impressed with the flavour and after taste of this protein drink. 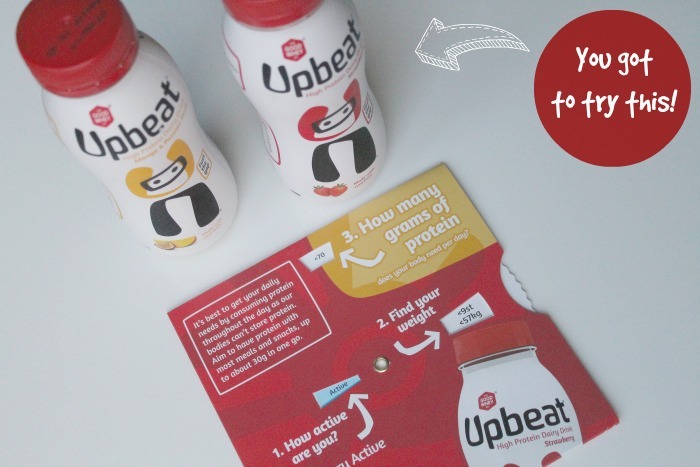 A lot of times, certain brands can leave a funny protein after taste, but Upbeat doesn’t do that. They have two flavours on the market at the moment, strawberry and mango & passion fruit. I thought I would only like the strawberry one, as I am usually very fond of strawberry over flavours like mango or passion fruit but in all honesty I like them both. I prefer the mango one if I am having it for breakfast or as midmorning snack while I work on my blog. And I prefer the strawberry one if I am having it for an afternoon snack or for class in the evening. I think it makes me feel like I had dessert for dinner. Or as many of my regular readers will know, I am just weird like that. I don’t know about all of you but I have a lot to learn about nutrition. I think we abuse our bodies more than we think we do. I know I have in the past and I am trying to change that without missing out on the yummy things in life. Sometimes it just takes a little education or trying a new product to help change that. 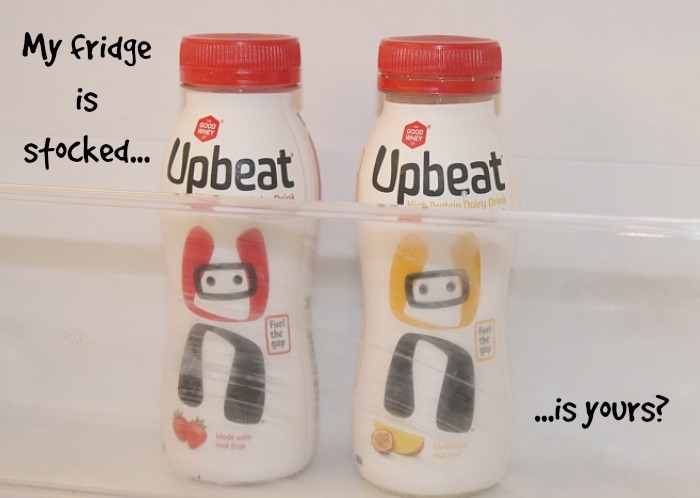 My fridge is now stocked with Upbeat is yours? You can find Upbeat at your local Tesco Express and Superstores, Booths, Holland & Barrett, or online at Tesco.com and Ocado.com. * I was sent this product for the purpose of this review, all photos and opinions are my own. I’m gona try these think I need a bit of a health kick to stop me eating too much sugar filled snacks. They are great! And I am the same trying to stay more away from sugar and be better about how much protein I am getting as I don’t think I ever have enough on a daily basis. These look yummy, as you know I am on a health kick and have been trying to stop snacking as much, but it’s so hard as I love to eat little and often. I may have to try these! Ya me too. Hoping these will help me as lately I have got ready bad. Good luck. They have a new flavor coming out soon too! Taste yummy.